President Cyril Ramaphosa is delivering his 2019 State Of The Nation Address (SONA) on Thursday 7 February in Cape Town. But what is SONA, where does it take place, where can you watch it and how will it affect you (traffic wise)? The State Of The Nation Address marks the opening of parliament for the new year. The president will address the entire country, reporting back on his administration’s progress over the past year, and then set out his administration’s agenda and priorities for the next year. 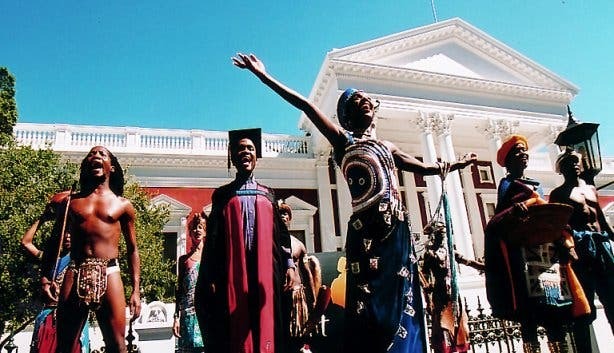 SONA and the opening of parliament take place at Parliament on 21 Plein Street in Cape Town this Thursday 7 February 2019 and dignitaries start arriving at parliament from around 4pm onwards. Before the address at 7pm, there is a short ceremony comprising a military guard of honour and a 21-gun salute. Bosasa, a company that secured some major tenders from government in the last decade, is currently at the centre of a massive corruption-whistleblower saga. It is widely expected that President Ramaphosa will address it at SONA. “I think Ramaphosa will address the Bosasa issue head-on, and use it as an opportunity to present a clean break from corruption,” Ancer comments. 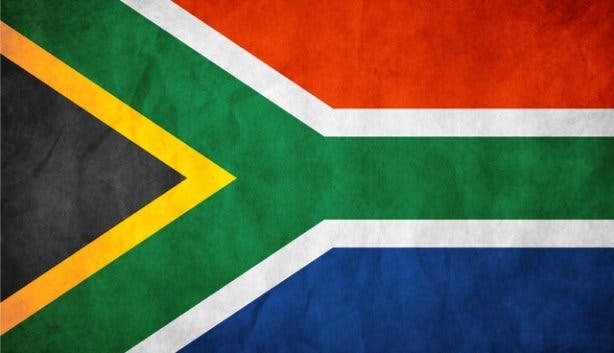 If you’re watching from home, SABC 2 will screen coverage of SONA from 6pm onwards on 7 February 2019. Or, you can see the whole event as it happens via parliament’s live YouTube feed. 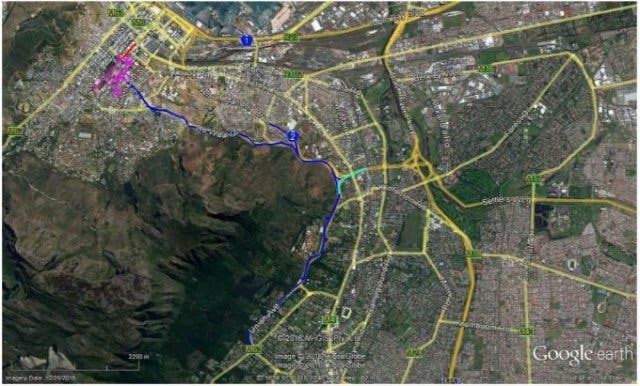 The road closures are set to affect the normal flow of traffic in and around the city bowl, Newlands, the M3 and N2 city-bound lanes so prepare to plan their routes accordingly. The Opening of Parliament takes place on Thursday, 7 February 2019 at 7pm. There will be rehearsals on Wednesday 6 February 2019 at 7:30pm. 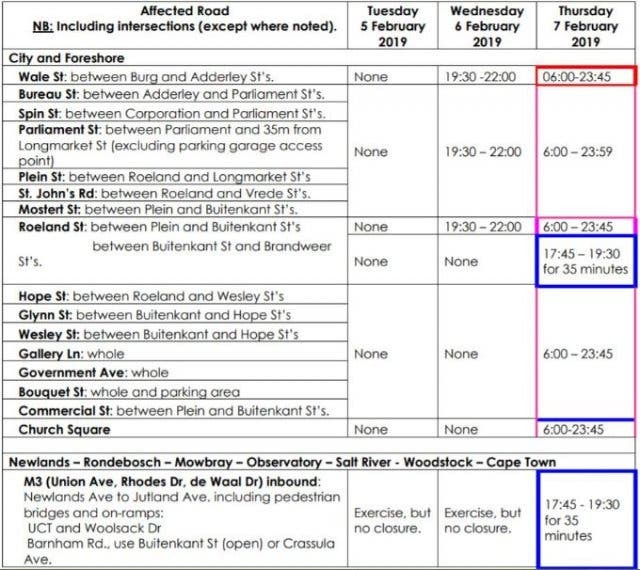 On Thursday, the bulk of the road closures in the CBD will take effect from 6am until midnight. 1. Security fencing will line the route in the CBD. There will be guarded pedestrian crossing points during peak time on Plein St (Shortmarket, Spin and Barrack St’s.) Pedestrians should be encouraged to make use of Buitenkant Street. 2. Company Gardens will be closed on Thursday 7 February from 6am to 11:59pm. 3. Darling St between Adderley and Buitenkant St’s and Wale St between Adderley and Queen Victoria St’s may be closed during the day on 7 February for security reasons. 4. Contingency closure in case of an emergency on 7 February 2019 (8am–11:45pm) may include the following roads. Parking Restrictions from midnight (11:59pm) on Wednesday, 6 February 2019 to Thursday 7 February 2019 to 11:45pm. Strand St: between Adderley and Christiaan Barnard St overpass. Church Square: corner of Spin & Parliament St’s. Roeland St: between Brandweer & Plein St.
Plein St: between Long Market Street & Roeland St’s. Spin St: between Parliament & Plein St’s. Parliament St: between Longmarket & Bureau St’s. St. Mary’s Cathedral Parking Area: between Bouquet & Roeland St’s. Commercial St: between Buitenkant and Plein St.
Barrack St: between Corporation and Plein St.
Mostert St: between Corporation and Plein St.
1. From the N2 (Settler’s Way): use the N1, FW de Klerk Blvd via M5 (Black River Parkway), or M7 (Jakes Gerwel Dr). 2. From the M3 (Union Ave): use the M5 (Black River Parkway) and N1 (FW de Klerk Blvd) or M4 (Main Rd), onto Victoria Rd, right onto Christiaan Barnard Rd to circle the outer CBD. 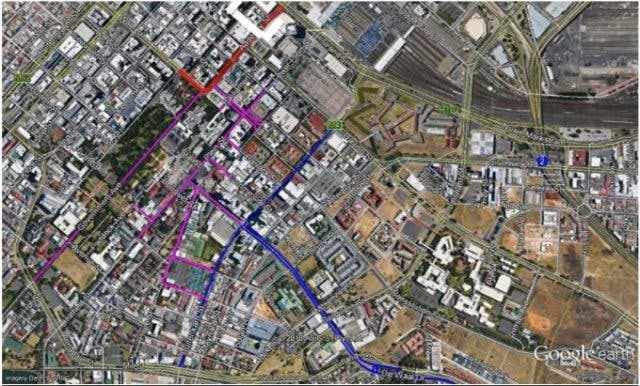 Note Tennant, De Villiers is closed; no access to Roeland St; Annandale/Orange St. Use lower CBD and circle around. Unless it’s for local access into the residential areas. right onto Christiaan Barnard Rd to circle the outer CBD. The Golden Acre bus terminus will operate as per normal on Thursday 7 February 2019. Bus operations from the terminus will proceed via Lower Plein St, Strand in the event Darling St is closed to traffic. Incoming buses will divert via Russell St, Strand St to the terminus. Note with this ceremonial route. Buses will operate as per normal from terminus into Darling St. In the event the Gathering on the Grand Parade becomes disruptive to traffic then exit via Strand St.
Emergencies: Call the City’s Public Emergency Call Centre; dial 107 (landline) or 021 480 7700 (cell). Enquiries: Contact the 24/7 Transport Information Centre at 0800 65 64 63 for any updates. Check out these cool spots to relax and enjoy a drink while SONA happens. This is where President Cyril Ramaphosa resides when he lives in Cape Town. Look at our annual February events to find out about more hot happenings taking place during the month.